This glove is something of a medical breakthrough. 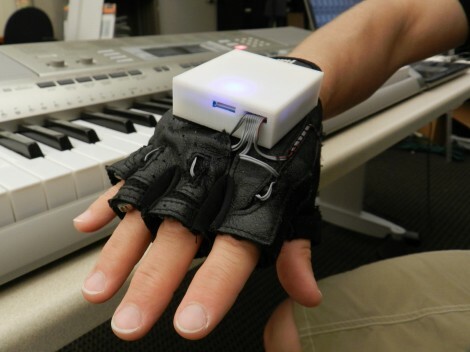 It’s used in conjunction with a musical keyboard to teach the wearer how to play simple songs. The thing is, instrumental proficiency isn’t the end goal. This is aimed at returning sensation to patients who have had a spinal cord injury. Many of the test subjects — all of which had the injuries more than a year before participating — experienced increased sensation in their hands and that is quite rare under these circumstances. There’s not a ton of information available on the hardware itself, but this image lets us make a pretty good guess. The glove is a typical fingerless cycling glove. There are two conductors worth of ribbon cable going to each digit. On the ring finger you can make out the bulging hardware which appears to be a vibrating cellphone motor. The white enclosure houses the microcontroller which receives wireless commands from a PC. When it is time for a finger to move, the appropriate motor vibrates. This is best explained in the clip after the break. Apparently the combination of sensory feedback and the need to react to it provides the therapeutic impetus which achieves the promising results seen in the study. From the stunned silence, I guess I’m not the only one wondering: is the fabric resistant to baby oil or vaseline? Some of the researchers at the Rehabilitation Institute of Chicago were working on something like this back when I worked there in 2003 or 4. Floors 13 and 14 were devoted to the Sensory Motor Performance Program SMPP and Machines Assisting Recovery from Stroke. THe PNE Glove is the one that was in the conceptual and brainstorming stage when I was there. My uncle has spinal cord injury , with movement in arms but not hands . I’m looking for something like this to possabily help him regain movement. How much would these cost . We live in NJ . And is it safe with him having a pacemaker ?